Duvet cover There are 126 products. 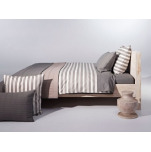 Set "Pinch" including 1 duvet cover and square pillowcase(s) 65x 65 cm. Reversible duvet cover: 2 sides with red, beige, pink, orange, purple and brown lines on white background, finishing bottle. Reversible lines pillowcase 2 sides match the duvet cover, bag pillowcase. Duvet cover and pillowcases : 100% combed cotton satin, 80 fils/m² or 200tc. Set "Retreat imagine" including 1 duvet cover and square pillowcase 65x 65 cm. Reversible duvet cover: 2 sides with beige, brown and white lines on white background, finishing bottle. Reversible lines pillowcase 2 sides match the duvet cover, bag pillowcase. Duvet cover and pillowcases : 100% combed cotton percale, 80 fils/m² or 200tc. Set "Shape" including 1 duvet cover and square pillowcase 65x 65 cm. Reversible duvet cover: 2 sides with orange, yellow, pink, burgundy, red and white lines, finishing bottle. Reversible lines pillowcase 2 sides match the duvet cover, bag pillowcase. Duvet cover and pillowcases : 100% combed cotton. Duvet cover with white on white lines patterns brilliant, 100% cotton jacquard satin. The duvet cover 140x200 cm comes with one pillowcase 65x65 cm. Duvet covers 200x200, 240x220 and 260x240 cm are sold with 2 pillowcases 65x65 cm. Pillowcases go with duvet cover. Quilt cover and pillowcase colors: orange and taupe, 100% combed cotton percale. Quilt cover double face, with a bottle of 40 cm: one side with embroidered face, an orange solid face. Square Pillowcase with quilted wheel, placed with embroidery. Easy ironing. Quilt cover and pillowcase colors: white and taupe, 100% combed cotton percale. Reasons: embroidered branches and leaves. Quilt cover double face, bottle shape with flap of 40 cm: an embroidered face and a united front. Square Pillowcase with quilted wheel, with embroidery. Easy ironing. Quilt cover mania and square pillowcase(s) 65x 65 cm 100% combed cotton. Reversible quilt cover with various patterns bands and colors terracota, sienna and burgundy, finishing bottle. Reversible pillowcase match the quilt cover, bag pillowcase. Quilt cover + pillowcase 65x65 cm storne, satin cotton. Quilt cover cover with line effects colors: taupe, beige, chocolate brown, charcoal gray, blue, turquoise and white. Quilt cover and pillowcase reversible. Quilt cover 140x200/220 comes with 1 pillowcase. Quilt cover 200x200/200, 00x200/200, 240x200/220 and 260x220/240 come with 2 pillowcases. Duvet cover+ pillowcase berlingo 100% combed cotton. Pattern on white background with colored lines effects: blue (light, medium and pastel), purple, turquoise and bright green. Shaped bag pillowcase 65x65 cm with blue piping. 140x200 duvet cover sold with 1 pillowcase. 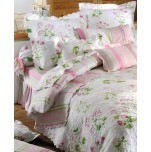 Duvet cover 240x220 cm and 260x240 cm are sold with 2 pillowcases. Duvet cover with pillowcase 65x65 cm burgundy, 100% satin cotton. Tonal patterns with wide strips of 8.5 cm. Duvet cover 240x200/220 sold with 2 pillowcases. Duvet cover and pillowcases reversible.